Isolation / Distribution Transformers have primary and secondary windings are physically separated from each other. 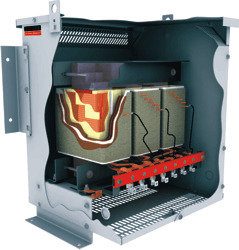 The windings of isolation transformer are insulated from each other and are referred to as "insulated". In an isolation transformer the output winding will be isolated. Secondary neutral to ground bonding eliminates common mode noise, providing an isolated neutral-ground reference for sensitive equipment. An isolation transformer allows an AC signal or power to be taken from one device and fed into another without electrically connecting the two circuits. Isolation transformers block transmission of DC signals from one circuit to the other, but allow AC signals to pass. They also block interference caused by ground loops. Isolation transformers are different from autotransformers in which the primary and secondary share a common winding. Isolation transformers are often used to protect high gain circuits, or prevent noisy ground paths in instrumentation. Copper and aluminum are used for transformer windings. These materials are available in a variety of grades and thickness, each with their own efficiency characteristic. Winding losses, or load losses, arise from the conducting material's inherent resistance to the flow of electrical current. Winding losses increase with the square of the transformer load. Efficiency gains can be achieved by using materials with lower resistivity or greater diameter. For example, coils made with copper can have considerably lower load losses than those make with other materials. Data based on popular 45 kVA size shows $1000/ year savings.